A few weeks ago, my family went to the Canada Science & Technology Museum. I’m ashamed to admit that I hadn’t been there since I participated many, many moons ago in Encounters with Canada, but was pleasantly surprised that some of the things I remembered and liked were still there but that most of the museum had been updated since my last visit, nearly 20 years ago. 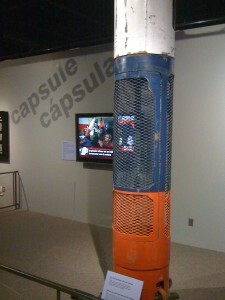 My young son marvelled at the train cars and the space exhibits, but the display that most moved me and will always stay with me is that of the Phoenix capsule, the feat of engineering and proof of the power of human determination that carried 33 trapped Chilean miners from over 2,300 feet below ground to the surface as the world watched. The men had survived for a record 69 days underground. When we initially made plans to go to the museum, we didn’t know that the capsule would be there. It’s a travelling exhibit and kudos to whomever was responsible for getting Ottawa on the tour. Like so many others, I watched the rescue unfold live on television in the late evening and early morning of October 12, 2010, shedding tears of relief and joy that this story, unlike the vast majority of mine disaster stories, had a happy ending. The whole world had been waiting with bated breath since August 22, 17 days after the initial collapse, when it was determined that the miners were still alive. The challenge then became to keep them healthy and stable underground while the Chilean government established and worked with a multi-disciplinary team to rescue those trapped. Engineers, geologists, psychologists, doctors, professionals from Chile’s armed forces, civilians and various other specialists from around the world worked around the clock to devise a rescue plan. It took a little over one month, but the Phoenix capsule was built and arrived on site at the mine September 25. Largely the work of ASMAR, built at the request of the Chilean president, the capsule met a rigorous list of specifications. Rather than creating gadgets and gizmos just for the sake of it, address a market need and you’ll have customers. The technical specifications to which the capsule needed to be designed were very precise and not easily done. Requirements included that the capsule must fit within a borehole no wider than 23 inches, have no weight limit, include a supply system for enriched air, safeguard the occupant from rockfalls, contain a means of keeping the miner upright were he to lose consciousness, have a communication system to both the exterior and interior of the mine, and more. This was no easy task, but the capsule that was designed met all of the specifications and as a result, got the job done. More than 80 people working around the clock in the areas of structural engineering, machining, tool- and die-making, precision mechanics, welding, metalworking, boilers, piping and docking constructed three prototypes that met the unforgiving demands of the task at hand. Without any one member of the team, the rescue might not have worked or certainly not gone as smoothly as it did. Because we’ve worked with companies that build medical devices, biopharmaceutical companies that are working to solve health problems, technology providers that help manufacturers to make better, safer products, and software providers that protect sensitive data from malfeasance and attacks, we know full well the power that technology has to make the world a better place. It sounds hokey but it’s absolutely true. What was science fiction not so long ago is now absolute reality. Believe in the power of technology to transform the world, because it can. Quite literally, billions of people around the world followed the story and millions watched the rescue unfold live on television. “This is more than a story, it’s a global community event,” Yuen Ying Chan, professor of journalism at the University of Hong Kong told CNN. Despite the glut of bad news reported daily by the media, a good news story like this can bring the world together. On the flipside, there has been little to no publicity about the Phoenix capsule visit to Ottawa that I can find. It’s a real shame since this was truly an important piece of recent history on display and I think that the museum would have received much more traffic had it been better publicized. As far as I can see, the capsule has been taken to Bochum, Germany where it is being displayed at the German Mining Museum as part of a special exhibition. If you happen to find yourself in that neighbourhood, I suggest you go see it for yourself.